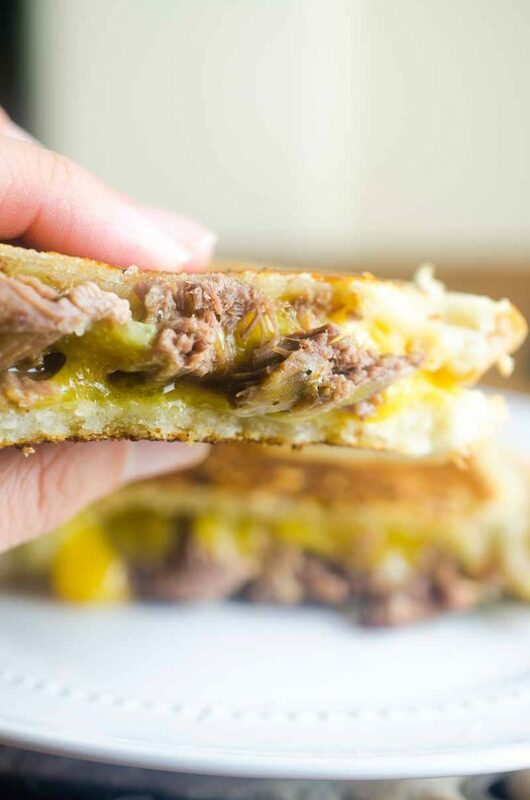 Pot Roast Grilled Cheese is THE BEST thing to do with your leftover Pot Roast. Loaded with cheddar, pot roast and pickles. It’s leftover bliss! We have grilled cheese sandwiches at least once a week. They are my go to when we’re busy or when we are just craving some cheesy goodness. Which, if you know me, is a pretty normal occurrence. It’s this love of grilled cheese that always leaves me on the lookout for new versions to make. Next to Fried Chicken, pot roast is one of our favorite Sunday suppers. The scent of it cooking all day in the slow cooker is hard to ignore. Despite how much we love it, we usually always have leftovers. 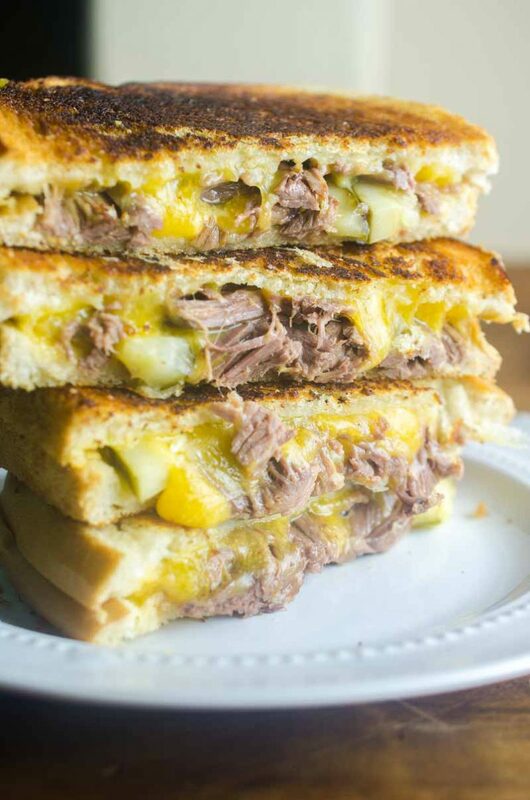 And while leftover pot roast is great on it’s own, adding it to a sandwich and making this Pot Roast Grilled Cheese is hands down the best way to use it. This Pot Roast Grilled Cheese is simple to make. There are only 5 ingredients. 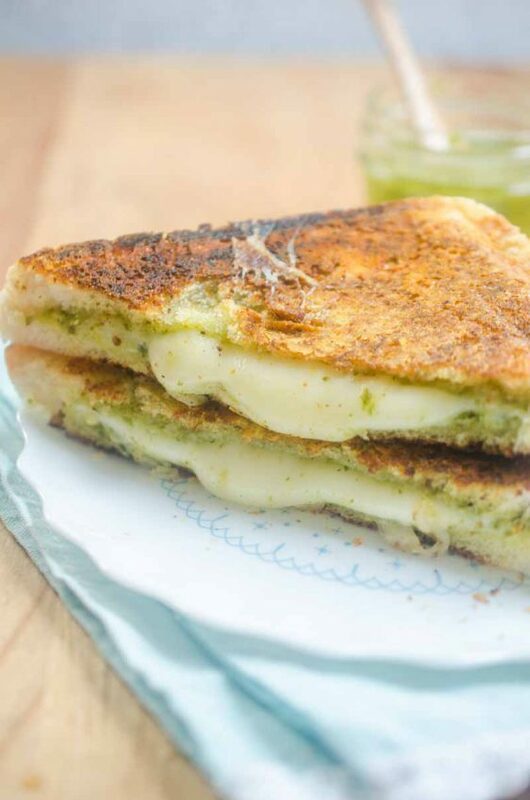 It can be made in less than 20 minutes and, as with any grilled cheese, it’s a hit with the whole family. 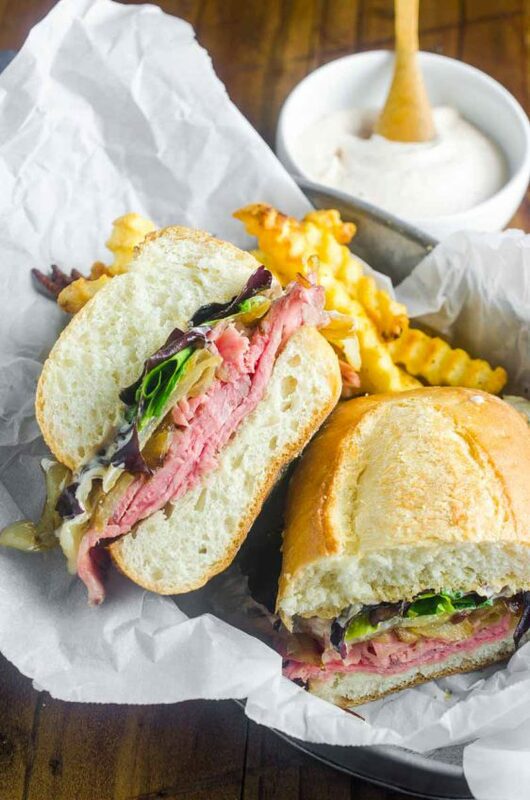 In addition to pot roast, you need sourdough bread. As much as I like crusty french bread with sandwiches, a good sourdough is perfect for grilled cheese. Next comes the cheese. REAL cheddar is the way to go. No American cheese with this one. I recommend Tillamook Medium Cheddar because, honestly, it’s the only medium cheddar I use. The next ingredient, pickles, might seem a little different but guys, trust me. 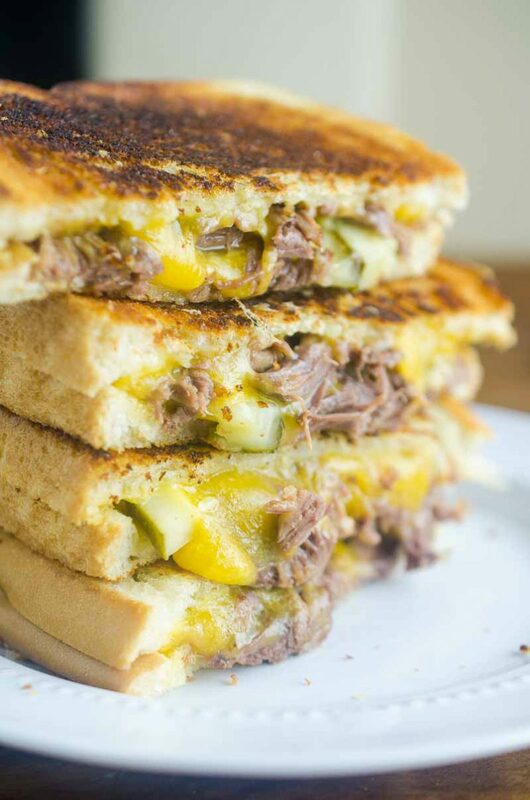 Pickles add a tangy crunch to this Pot Roast Grilled Cheese that cannot be beat. If you are a looking for a great way to use up your leftover pot roast or are simply looking for meaty, cheesy goodness, you’re going to want to make this Pot Roast Grilled Cheese ASAP. The video below shows you how easy this Pot Roast Grilled Cheese is to make. Spread butter on one side of each slice of bread. On the non buttered side, layer cheese, shredded pot roast, pickles and more cheese. Cook sandwich over medium heat until bread is golden brown and cheese is melted. Serve immediately. Looks divine! All that cheese! My whole family will go crazy over this! I absolutely love pot roast, but eating it plain does get tiring after a while. What a creative and tasty spin to put on a classic! Love finding new ways to make grilled cheese! Can’t wait to try! Ooh this looks like such a good combination !! What an awesome idea!! I’ve never thought to do this but YUM! Trying soon! I definitely want to try this sandwich for breakfast or lunch. This is a really great idea. I’ve never had anything like this. Looks good! Wow, this sandwich looks very tasty. I’m sure it’s very tasty. I definitely want to try your recipe. THANK YOU! Wow this is amazing! Looks absolutely delicious, such a great idea! 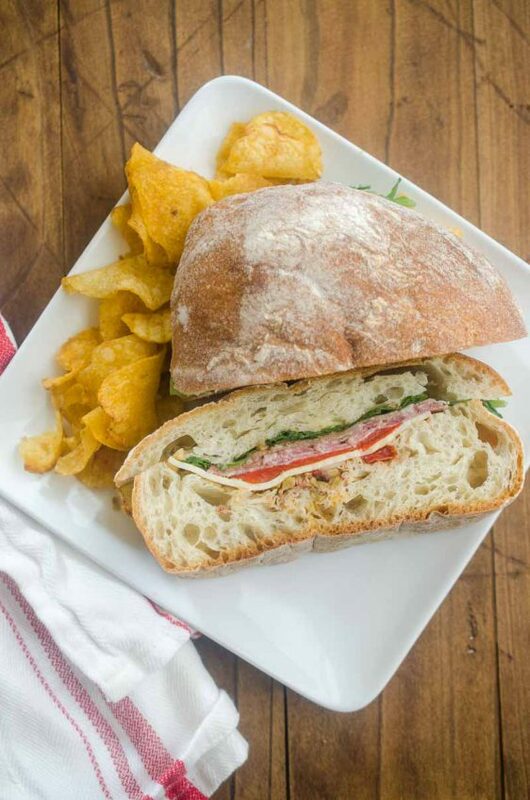 This is a great idea for lunch. Looks beautiful and tasty! Cannot wait to try this. This recipe looks incredible! 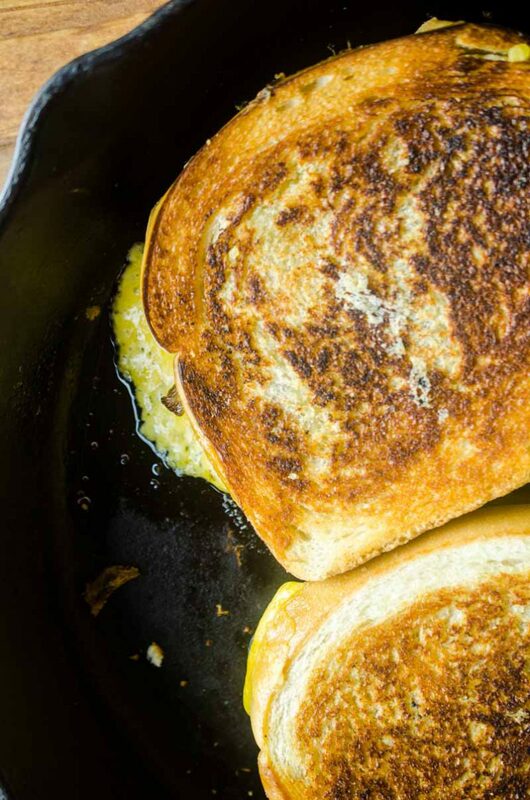 I can’t think of a better grilled cheese recipe than this. 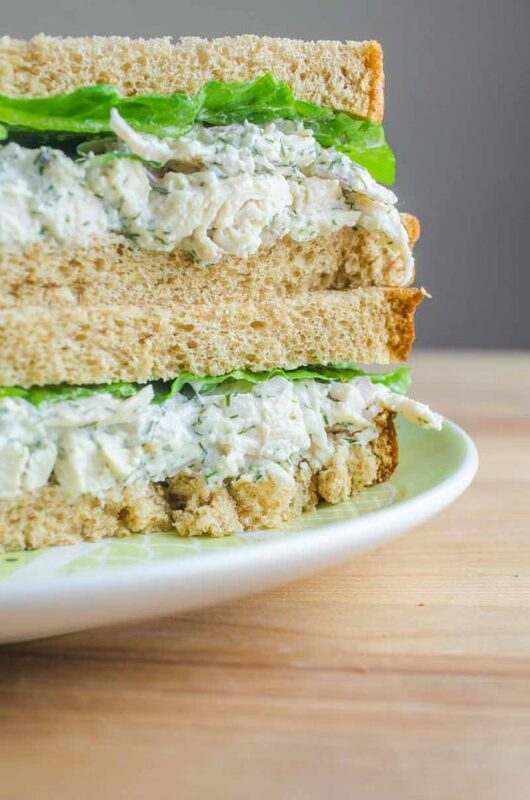 Such a delicious way to use leftovers! Thank you!! It is pretty much grilled cheese bliss! Craving this grilled cheese right now! So good! Getting creative with leftovers always makes them taste better! This looks so comforting and warm on a cold day! Yes, with a bowl of your favorite soup!!! 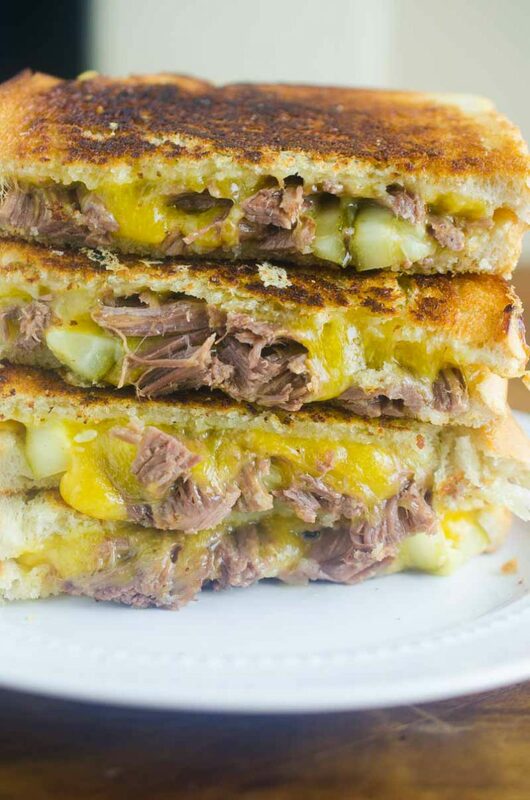 Love the addition of pot roast to the classic grilled cheese! 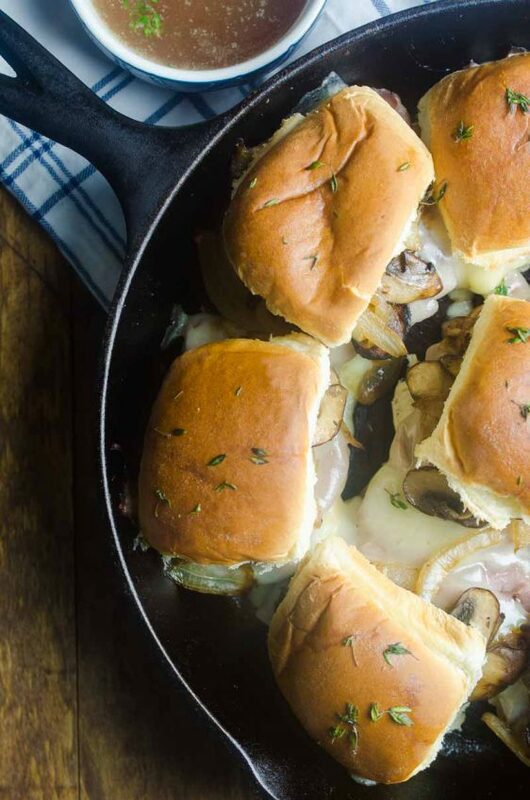 Love adding meat to a grilled cheese sandwich but never thought of pot roast until now! Yum! This looks amazing. I’m already drooling for the cheese pull!! 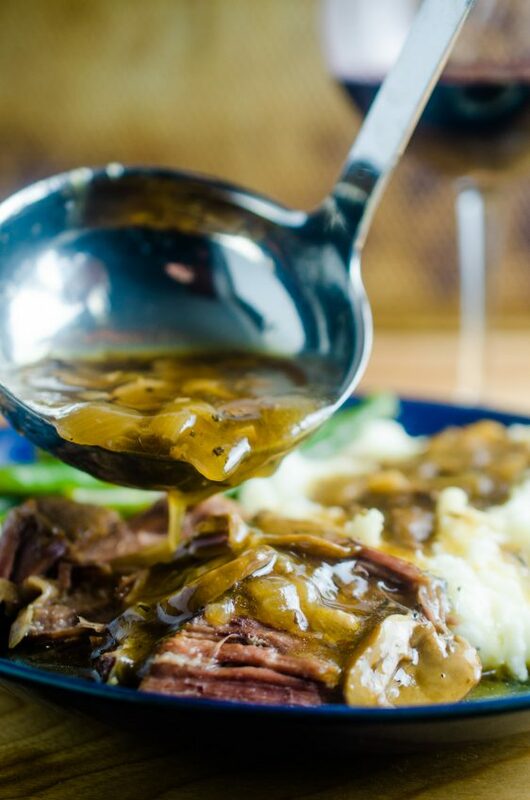 Such a delicious use of leftover pot roast! This looks so delicious! What a great idea for leftover pot roast! What a great way to use leftover pot roast! Oh my goodness, it’s WAY too late at night to even be thinking about food but oh, how I want one of these right now!! My cheese loving family would go crazy for these! Looks like comfort food at its finest! Perfect for a cold, winter day.